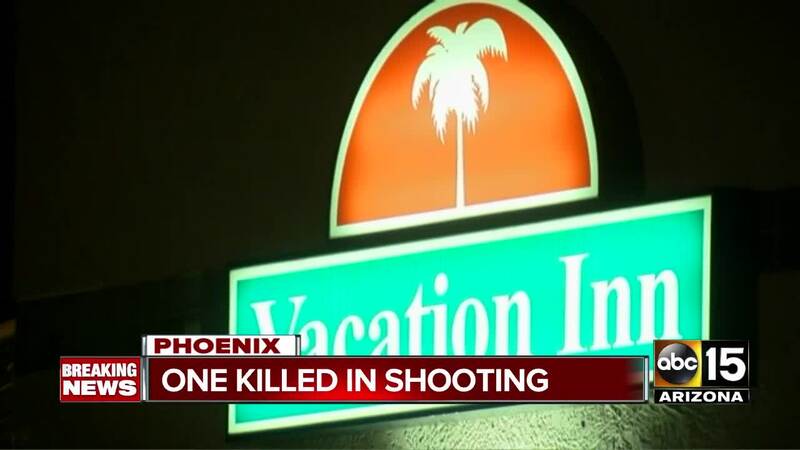 A man has died following a shooting at a hotel in Phoenix on Saturday night, according to Phoenix police. PHOENIX — A man is on the run after shooting and killing a person during a confrontation in central Phoenix on Saturday night. According to Phoenix police, the victim confronted two women at a business near Interstate 17 and Thomas Road around 8:15 p.m. Saturday. One of the women was allegedly the man's ex-girlfriend, according to police. The ex-boyfriend had a knife and threatened the women, police say. An unidentified suspect asked the women if they needed help and stepped in to intervene, according to police. The two men began to argue when the suspect shot the man who had been threatening the two women. The shooting victim was taken to an area hospital, but later died from his injuries. Police say the suspect fled the scene and is currently outstanding. The victim's name has not been released by police; however, they did identify him as a 38-year-old man. Police are asking anyone with information to contact the Phoenix Police Department at 602-262-614. Those who wish to remain anonymous can contact Silent Witness at 480-WITNESS or 480-TESTIGO for Spanish.